Researchers on the SPECTRE 2 team monitor their experiment. Each of the principal investigators for the payloads flown received a SpaceTech-REDDI grant, enabling them to select an appropriate commercial flight provider for demonstrating their payloads. During these parabolic flights, researchers experienced up to 25 parabolas with intervals of microgravity that enabled them to evaluate the performance of their experiments in a relevant, space-like environment. For the SPECTRE 2 experiment from NASA’s Jet Propulsion Laboratory, the flights were critical in validating the performance of system-level hardware in advance of a potential Mars Sample Return mission. SPECTRE, which stands for Sample Pinning Experiment for Capture Technology in a Reduced-gravity Environment, is an application of the flux-pinned interface technology. FPIs leverage the physics of magnetic flux-pinning to allow spacecraft in close proximity of one another to maintain a stable relative equilibrium without mechanical contact or active control. FPIs can provide key capabilities such as sample capture, manipulation, and containment assurance for planetary missions, as well as formation flying, docking, grappling, and tuning isolated pointing platforms. A second payload from JPL, the Biosleeve Gesture Control Interface, also flew on the recent ZERO-G campaign, adding data to its first set of parabolic flights completed in March 2017. The Biosleeve could be embedded in extravehicular activity suits to aid astronauts with gestural control of robotic assistants in space. 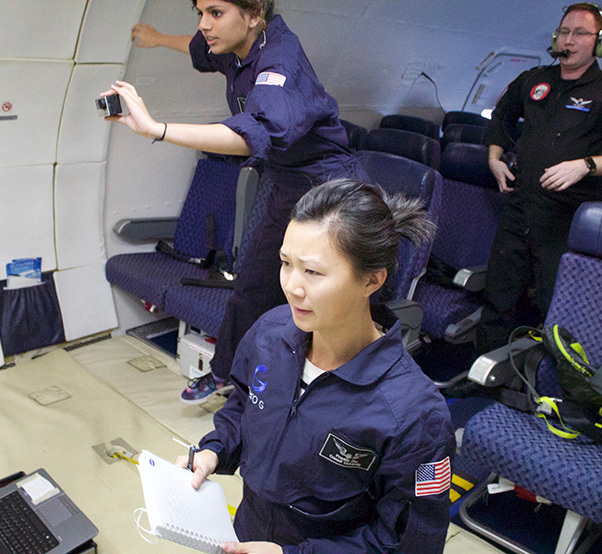 For these flights, researchers aimed to evaluate the effects of microgravity on gesture recognition performance and the Biosleeve’s recently retuned experiment set-up. Christopher Assad, principal investigator, noted that the recent flights allowed the team to collect additional data that should improve the significance of their performance analysis and conclusions. “Our test subjects successfully demonstrated gesture recognition while wearing the BioSleeve in a micro-gravity environment, and data was collected from its sensors for post-experiment analysis to evaluate and help improve the gesture control performance,” said Assad. Carthage College’s modal propellant tanks undergo zero-gravity slosh during flight. 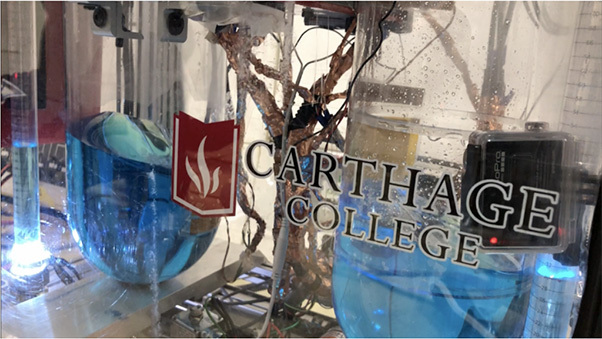 The last payload flown in the campaign, Carthage College’s Microgravity Propellant Gauging Using Modal Analysis: Phase III, was also adding new data to a previous round of parabolic flights completed in November 2016. Designed to address the feasibility of gauging propellant levels in microgravity, the experiment was deployed in two configurations on the most recent ZERO-G flights. Researchers aimed to validate the system’s latest design and reduce the overall system risk for future flight demonstration missions—critical towards the adoption of the technology for launch propulsion systems and other space-based propulsion technologies. Kevin Crosby, PI for the experiment, noted the success of the flight campaign in increasing the team’s knowledge base. Among them: an improved understanding of how modal gauging is affected by propellant slosh and other transient vehicle dynamics. Crosby added that the value of demonstration with Flight Opportunities has been critical to advancing the technology. Through the Flight Opportunities program, the Space Technology Mission Directorate selects promising technologies from industry, academia and government for testing on commercial launch vehicles and enables public-private partnerships for the agency. The program is funded by STMD and managed at NASA’s Armstrong Flight Research Center in Edwards, Calif.